If you are a purist, you may wish to stop reading at this point and look instead at other Learning Sites projects. The temple described and depicted below is the result of a compilation of data collected from Tell Halaf (the architecture) and Arslan Tash (the guardian animals) in order to create a plausible complete Assyrian temple to place in our educational package about Til Barsib. That may sound odd, but the result is supported by the archaeological evidence from the three sites. Excavations in the lower city at Til Barsib (below and to the northwest of the palace) have revealed some meager remains of an Assyrian-period temple and sculpture that plausibly could have come from that structure. A contemporary temple was uncovered at Tell Halaf. It is nearly fully intact, but lacks sculpture and interior decoration (except for engaged, colored half-round columns set into the walls at the end of two rooms). The Assyrian temple from Arslan Tash does not survive very well. However, the guardian animals (bulls and lions) that once stood at its main entries were found in good condition and are now at the museum in Aleppo. All three sites lie relatively close to one another on known trade routes. The preserved pieces from the temples have been brought together to create a plausible Assyrian temple for the site of Til Barsib (in order to round out our educational package, providing students with a palace, a temple, and a city gate). 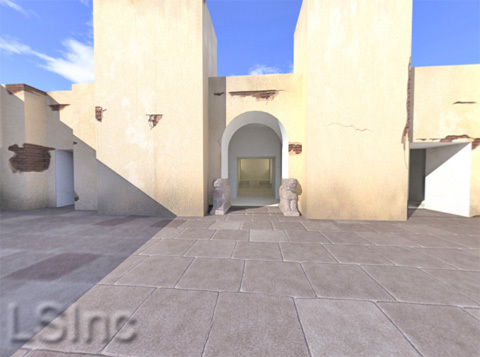 The rendering at the left (hover over to enlarge) shows the inner courtyard of the Halaf temple complex. The main sanctuary is through the archway, flanked by lions (reconstructed based on examples from Arslan Tash). 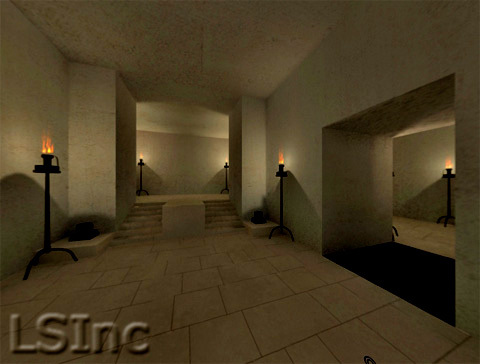 The rendering at the left (hover over to enlarge) depicts the main sanctuary, with the subsidiary space at the right (which has the engaged half columns at its end wall). All the walls of the Tell Halaf temple consist of mud bricks, 40 x 40cm square. Wall surfaces were smoothed with a coat of mud plaster, on top of which was a coat of white gypsum plaster. The pavement throughout consisted of smoothed, rectangular limestone slabs. The sanctuary was divided into an eastern part, where cult activity presumably took place, and an elevated western part, 90cm higher, where the statue or symbol of the deity should have been located. The northwest and southwest corners of the lower part of the sanctuary each had a stairway of seven steps leading up to the platform. None of the superstructure of the walls in this room survives, so that we cannot tell if or how it was decorated. 1950 Tell Halaf II. Die Bauwerk. Berlin: Walter de Gruyter. nd Notes on Assyrian temple architecture composed for the Dalton School (NYC) classroom software called Archaeotype and used as the basis for our reconstructions. © 2002-2019 Learning Sites, Inc.